There's a new featurette focusing on the women of Wakanda. Specifically, it focuses on the warrior women Okoye and Nakia and the fighting group the Dora Milaje. 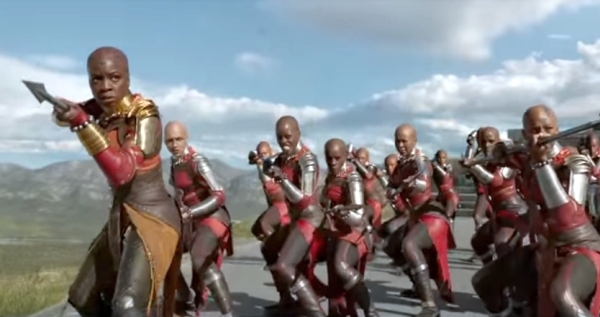 In the Marvel comic books, the Dora Milaje are an all-female group of highly trained bodyguards. You can read all about the Dora Milaje in our post. The clip opens with Chadwick Boseman, who plays Black Panther, saying that as "he is a world leader. That's a responsibility that other superheroes don't commonly have. That he has to look out for an entire nation." Danai Gurira explains who the Dora Milaje are. "The Dora Milaje are women who pledged their lives to the throne and to the security of the kingdom," she says. "My character Okoye is the general of the armed forces as a whole,"
Lupita Nyong'o says"Okoye represents the old guard and tradition while my character, Nakia, challenges tradition." "Nakia was born to be a warrior," Nyong'o says. "She was born with a warrior spirit." There's an awesome behind-the-scenes shot along with Gurira explaining the fighting style of the Dora Milaje as "moving as one" and comparing it to a "wall". Miachel B. Jordan, who plays the villainous Erik Killmonger, says "this is not your typical film" and reminds us "it's real". What do you think of the video? Are you excited for the women of Wakanda to take charge?